We need to create two web sites: store1.com and store2.com. First, let’s create the first site. Unzip Mаgentо into the folder on the server. Then install it, configure and now the site is ready to use. 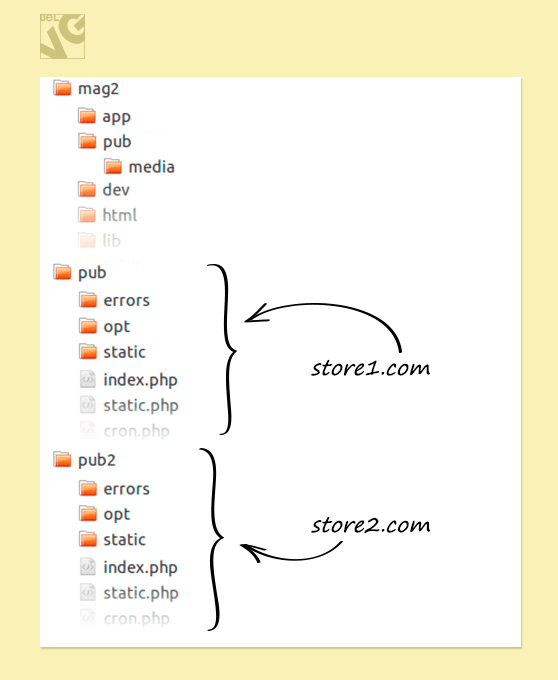 You can install the second store in the same way as the first one, but I would like to describe a new interesting feature: the “Pub” folder in the Magento root. 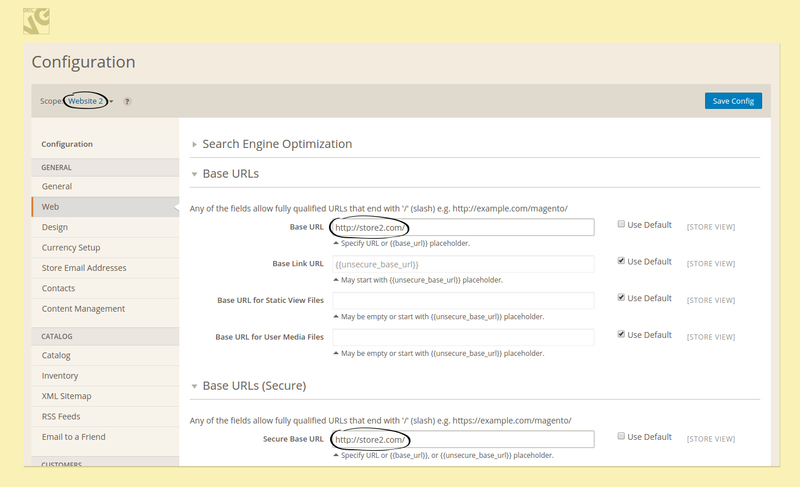 The store domain can be connected both to the folder into which Magento has been unzipped and to the Pub folder. In both cases we will get a full running store. Pub/media – the media folder has also been moved here. Be sure to remember the code of the store. Magento is not able to detect from which domain the user has come, that is why we need to help it. What if we make a copy of the Pub folder and connect the domain to that copy? For example, let’s name the folder as “pub2 “. When we assign another folder for the store, we should remember that the files, that define the appearance of the store, will also be placed here. Yet with the Media files the situation is a bit different. By default they are loaded only into the Pub folder, even if the product is available in several stores. When visiting the second store we will not be able to see any product images yet. This means that by creating a separate folder for the second store we have only made things more difficult. But let’s fix this. And also make several improvements for get.php, which is responsible for loading images. All stores are working now. But what if we separate the Pub folder from Magento? The Media folder collects all uploaded images, that is why we leave it on its place. So we will separate only the appearance of our stores. What does this give to us? For instance, this way we can create separate zones for developers and frontend developers. Of course, we will be able to see if these ideas can be applied only after Magento 2 is released. But in this article I just wanted to experiment and share my thoughts. Is this the way to do it in the released version 2.x?